R1 use is typically single family homes, R2 is typically a duplex or two-family home use, and R3+ are primarily townhouses and apartments. A few weeks ago I examined the size distribution of land parcels in Rockingham County, and was asked whether such data existed for the City of Harrisonburg. It does! As you'll see below, most (92.5%) land parcels in the City of Harrisonburg are less than an acre in size. While Rockingham County is home to 46,600 parcels of real estate,Harrisonburg is divided up into only 15,075 parcels. While thelargest parcel in Rockingham County is the National Forest (140,001acres), the largest piece of land in Harrisonburg (148 acres) is ownedby James Madison University. The average lot size in the City of Harrisonburg is 0.64 acres. More to come in future days --- the data from the City of Harrisonburg provides additional descriptors (such as "current use") that will be interesting to analyze! Rockingham County: Value Down but Assessments Up??? Rockingham County is currently in the process of reassessing all real estate in the County. When the new assessed values are sent to property owners, there is bound to be some distress and consternation, as assessed values will increase (in many cases), yet homeowners know that home values have been decreasing over the past few years. First, have home values decreased over the past few years? This shows a 4.8% decline between 2007 and 2008, and a total 8.5% decline between 2007 and 2009. So, why will many assessed values going up? The new assessments (effective for 2010 - 2013) will be based on real estate transfers during 2008-2009, when the median sales price was/is $200,000. The old assessments (effective for 2006 - 2009) were based on real estate transfers during 2004-2005, when the median sales price was $175,000. As you can see, many homeowners will likely be confused and concerned. They'll think it just isn't fair that assessed values are increasing when they know real estate values are decreasing. It will likely be little consolation that real estate values actually have increased in the full time span since the last reassessment. In this scenario, the total tax liability would have been $6,000 over the same five year time period, $600 higher than reality. Check out these two stories about Urban Exchange that both hit the news today . . .
Harrisonburg leaders have a vision for how to make their downtown thrive. Barry Kelley is helping bring that vision into a reality. "I know downtown pretty well. And I thought this was the perfect area for the kind of project that we were thinking about doing," said Kelley, who with fellow property developer Andrew Forward has turned a Downtown Harrisonburg parcel that was most recently a used-car lot into a four-story, mixed-use architectural wonder called the Urban Exchange. On East Market Street, amid the bustle of the city's downtown, a natural oasis has sprouted in perhaps the most unlikely of places. Dozens of ginkgo and crape myrtle trees and a selection of native plants line a pathway, while benches offer a place for folks to enjoy the scenery. It is not the city's latest pocket park. Instead, this organic retreat is located two floors up on the roof of the retail space and parking garage at Urban Exchange. 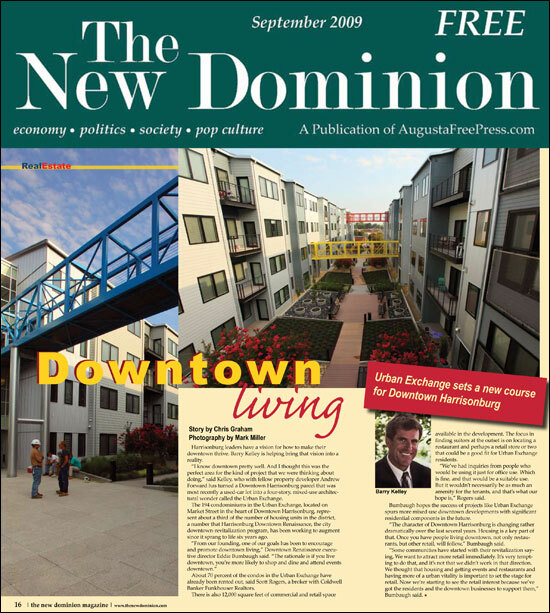 Below you will find an embedded version of my August 2009 report on the residential real estate market in Harrisonburg and Rockingham County. SUMMARY: The pace of home sales continues to slow, home values continue to stay relatively steady, and thus we haven't turned the corner yet to head back to more hopeful times. Click here to access a larger version, download a PDF, share it with a friend, etc. Do you have questions? Suggestions for other analysis? Do you disagree with the perspectives I offer? Feel free to leave a note in the comments section, or e-mail me at Scott@HarrisonburgHousingToday.com. I showed four homes in the City of Harrisonburg this afternoon to one of my buyer clients, and as my clients and I viewed the homes we sensed a very strange relationship between asking prices and our perception of their value. That is to say that we didn't sense much of a correlation between what the owners were asking for the houses and what we thought they were worth. To explore the relationship (somewhat) objectively, I thought I'd compare the asking prices to assessed values. But first, here is how sale prices and assessed values compare for the last three sales in the City of Harrisonburg between $240k and $260k. Property #1 sold for $244,500 and is assessed for $240,300 --- 102% of assessed value. Property #2 sold for $252,000 and is assessed for $259,400 --- 97% of assessed value. Property #3 sold for $250,000 and is assessed for $273,800 --- 91% of assessed value. Property #1 is listed at $239,000 and assessed at only $213,900. The list price is 112% of the assessed value, which was evident when we viewed the home. We thought the asking price was pushing the envelope. If listed for the average of 97% of assessed value, at $207,483 it would have been MUCH more interesting! Property #2 is listed at $249,900 and assessed at $228,400. The list price is 109% of the assessed value. Again, we were scratching our heads trying to figure out why it was priced as high as it was. Again, if it had been listed at 97% of assessed value ($221,548) it would have been MUCH more interesting! Property #3 is listed at $249,950 and assessed at $266,900. The list price is 94% of the assessed value, and this was CLEARLY evident --- the property seemed to be a good value even at the asking price. Property #4 is listed at $289,000 and assessed at $235,100. The list price is a whopping 123% of the assessed value. As you might expect, the asking price on this house was the most shocking to us, which makes sense when now looking at the assessed value. BOTTOM LINE -- the assessment for your property shouldn't be the primary OR only guide for pricing your home . . . BUT if you are more than 3% or 4% above the assessed value, you might want to reconsider your pricing strategy! For almost a year now, I have been posting information about scheduled foreclosures (Trustee Sales) in Harrisonburg and Rockingham County to HarrisonburgForeclosures.com. Thus, this analysis is based on properties that are headed towards foreclosure, but isn't just based on those that are actually foreclosed upon. As you may have imagined (above) most of the properties are in Harrisonburg (which includes Harrisonburg-addressed Rockingham County properties, and is the largest area in the County). Coming in behind Harrisonburg are Elkton, Broadway and McGaheysville. Click here to view a larger version of this document. As you can see, the vast majority of these homes were purchased in 2005, 2006 and 2007. This should serve as no significant surprise, as that was when loan requirements were being pared down and pared down, such that anyone with a pulse could obtain a mortgage. These lax guidelines resulted in some people owning homes that weren't really in a financial situation that would allow them to consistently pay their mortgage. I'll update this analysis from time to time, but one thing that you ought to be sure to remember is that (thankfully) Harrisonburg and Rockingham County have an extremely low rate of foreclosure as compared to other parts of the country. This is wonderful news, as it has not negatively skewed our home values as has happened in many larger metropolitan areas. 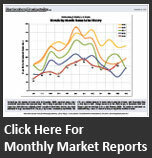 For more details on upcoming foreclosures, visit HarrisonburgForeclosures.com.